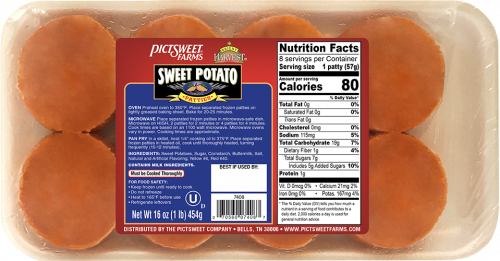 Delicious, healthy and convenient define Pictsweet Farms Sweet Potato Patties. These perfect portions are ideal as a side, appetizer, or snack. Add your own toppings like brown sugar and pecans for an extra sweet treat! OVEN Preheat oven to 350°F. Place separated frozen patties on lightly greased baking sheet. Bake for 20-25 minutes. MICROWAVE Place separated frozen patties in microwave-safe dish. Microwave on HIGH, 2 patties for 2 minutes or 4 patties for 4 minutes. Cook times are based on an 1100 watt microwave. Microwave ovens vary in power. Cooking times are approximate. PAN FRY In a skillet, heat 1/4" cooking oil to 375°F. Place separated frozen patties in heated oil, cook until thoroughly heated, turning frequently (10-12 minutes). Sweet Potatoes, Sugar, Cornstarch, Buttermilk, Salt, Natural and Artificial Flavoring, Yellow #6, Red #40. CONTAINS MILK INGREDIENTS.